Whenever you are in the Philippines and ask random people about their favorite dish, the common answer would probably be Adobo. Basically a meaty, flavorful and marinated in a distinct combination of sauce and spices, this would probably give you a feeling of being at home. Located in Dela Rosa Carpark 1 in Legaspi, Makati, with branches all over Metro Manila, this restaurant offers a wide variety of Adobo. Everyone can choose between Adobo Flakes, Spicy Beef Adobo, Classic Liempo Adobo, and a lot more that costs between 99 to 149 pesos only. Located in Ayala Triangle Gardens, this establishment opens from Mondays to Sundays. 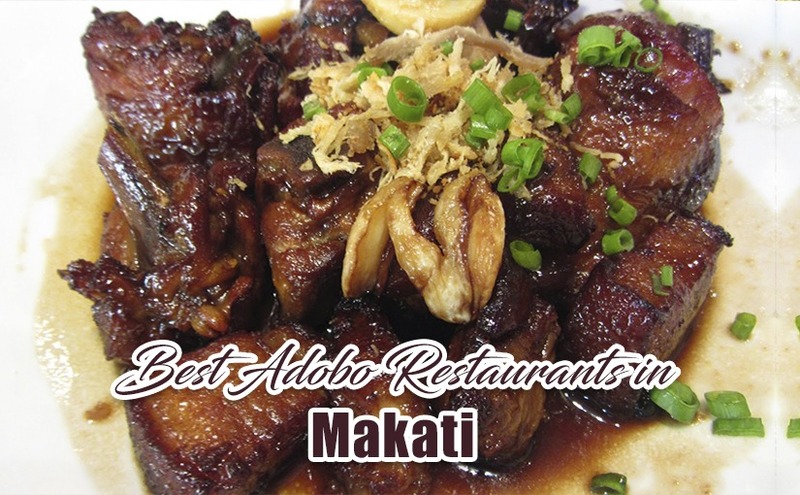 This is considered to be one of the most romantic restaurants in Makati and has one of the best adobo dishes in the Metro. In addition to your delicious dish are all sorts of music may it be blues, jazz, samba, etc. A restaurant that can be found in One Rockwell Building in Hidalgo Drive, this is managed by the Best Female Chef in Asia for 2016 opening from Mondays to Sundays. The restaurant uses lamb, which is not common in adobo. It is made in a very delicious manner that even those who are not fond of eating lamb would find the dish perfect. Located in Greenbelt 5 in Ayala Center, this is a Spanish-Filipino restaurant that has three delicious variety of Adobo: Crispy Adobo Chicken Skin and Tails, Catfish Adobo Rolled in Bacon, as well as Adobo Pork and Chicken. A fun fact, it was named after the two important characters of Jose Rizal’s famous novel Noli Me Tangere: Padre Damaso and Pia Alba.